In the Spring, we put up some cottages for the birds, hung a bamboo house for the Mason bees, and built a new feeder for the birds. Now that we have moved into the dog days of Summer, we thought we would bring readers up to date on the goings on in the RainyDayGarden. May: While the rain fall for the month of May was about normal (3.22″, whereas the average is 3.37″) the temperature was far above the norm (77º vs. the average of 62º). Because of the warmer conditions, many of the plants kicked into gear early. Last year, for some unknown reason, the lilac bush did not bloom at all. It was not the case this year. The sweet scent was quite evident in the garden during the entire month of May. While not as fragrant as the lilac, the irises in the RainyDayGarden bloomed continuously from April to June. June: This was one of the wetter Junes on record (10.5″ vs. the average of 3.68″). 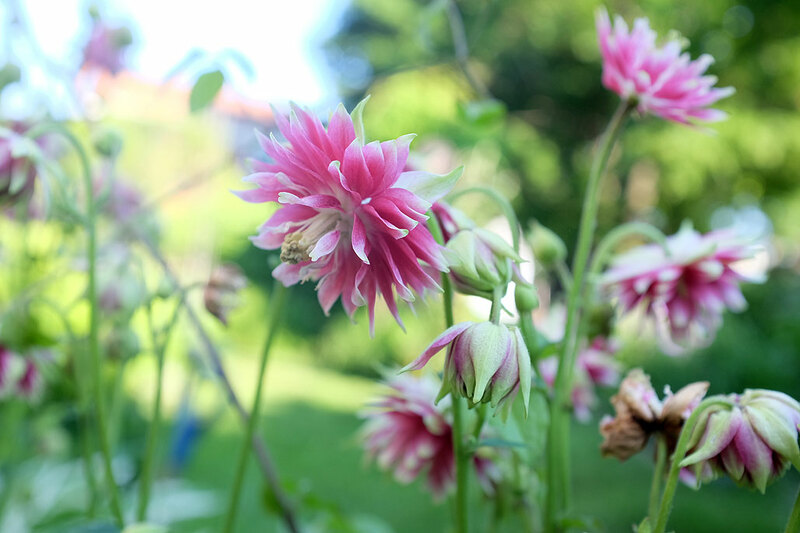 The abundance of water combined with the warmer temperature (77º vs. the average 72º) enabled thye perennials such as peonies, columbines, and day lilies to really put on a show. Others are on deck to do the same in July. With all the rain in June, we were a little worried about the bird cottages we put up in April. We got these bird houses from Gardener’s Supply Company. A few readers were concerned because some of the comments on the site suggested that the cottages were not holding up to the elements. We are happy to report that our experience have been entirely positive. After two months of direct exposure to sun, wind, and a LOT of rain, all three cottages still looked like new. There have been no problems with paint peeling or pieces coming unglued. It appears that whatever production issues existed with these cottages were either anomalies or have been corrected. At the end of May, we put up a house for Mason Bees (also available at Gardener’s Supply Company). We kept an eye on it, but not much happened for a few weeks. However, last week we noticed sticks poking out of a few of the tubes! Upon closer inspection, it is clear that some of them are definitely occupied, by what we do not know. July: The first month of Summer started off with New England embroiled in a heat wave. Ninety degree temperatures covered the metropolitan Boston area for over a week. 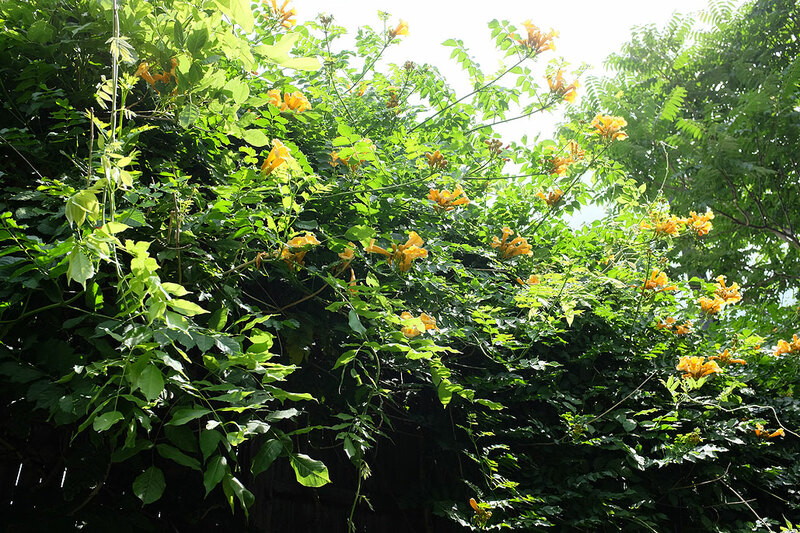 While the more delicate plants such as spiderworts and ferns struggled under the oppressive heat, the trumpet vine, purple cone flowers, and passiflora soaked it up. 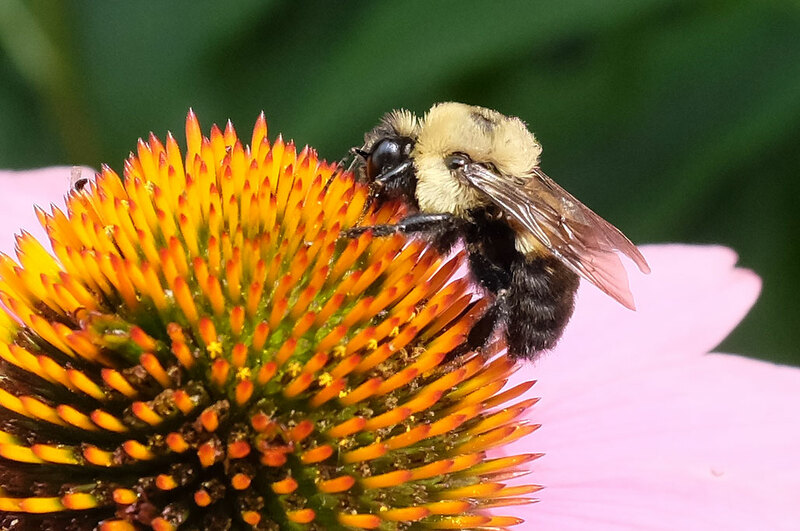 The hot weather may have driven us inside, but it certainly did not discourage the bees (bumblebee, mason bees, honey bee). In fact, with the cone flowers in full bloom, they were out in force busily buzzing about gathering pollen. We planted the passiflora vine in the ground (as opposed to in a pot) a few years ago. Passifloras totter on the edge of hardiness for New England. Every year since we planted this one we wondered if it would make it through the winter. 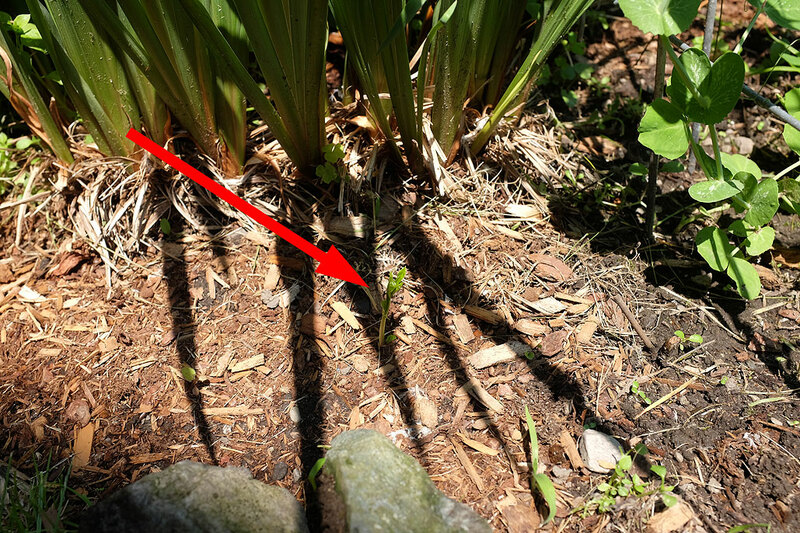 In mid-June, we spotted a small sprout poking out of the mulch with the signature three-lobed leaf. That little has guy has been on a tear ever since. A few weeks later, we spotted four other climbers in the patch. The fastest growing ones are those trying to climb up and over the siberian irises. It looks like it is going to be a very healthy year for the passiflora. 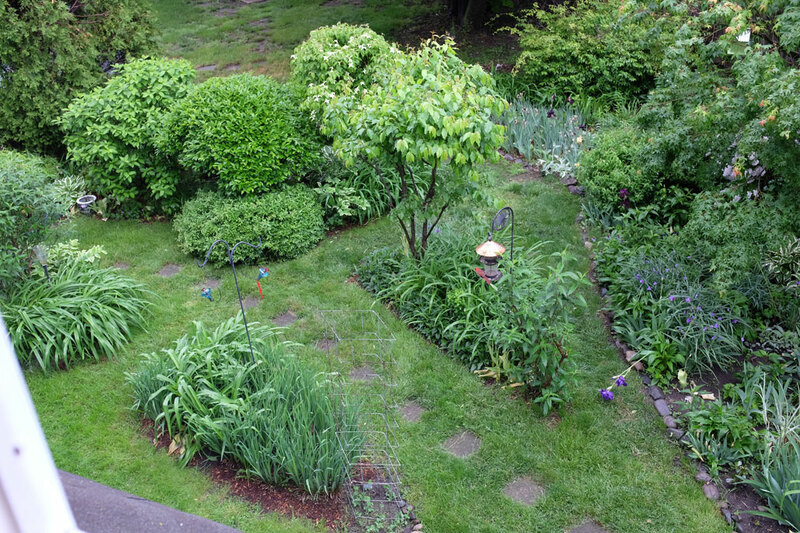 The next RainyDayGarden update will be at the end of the Summer. By then we should have pics of the blooms on the butterfly bush and passiflora vines, and with any luck big red juicy globes of our tomato plants. The Fall flowers such as the Black-eyed Susans and Sedum ‘Autumn Joy’ should also be pretty far along. Look for the write-up in September!